Upcoming options for a concert at a brewery include avant-garde at High Line, a one-man-band at Dandy and the Kensington Sinfonia at Village. Bug Incision has finally found a perfect home at Highline Brewing. Photograph by Jarrett Edmund. Live music and beer go together like movies and popcorn and it’s starting to feel like there’s a new brewery opening every other day in this city. So is it really any wonder that live music at breweries is on the rise? If you haven’t acquainted yourself with this flavour of entertainment just yet, there are several tantalizing options just around the corner for you to sample. Read on for a few fun options for a musical night out at a brewery and the beer you should pair with the tunes. 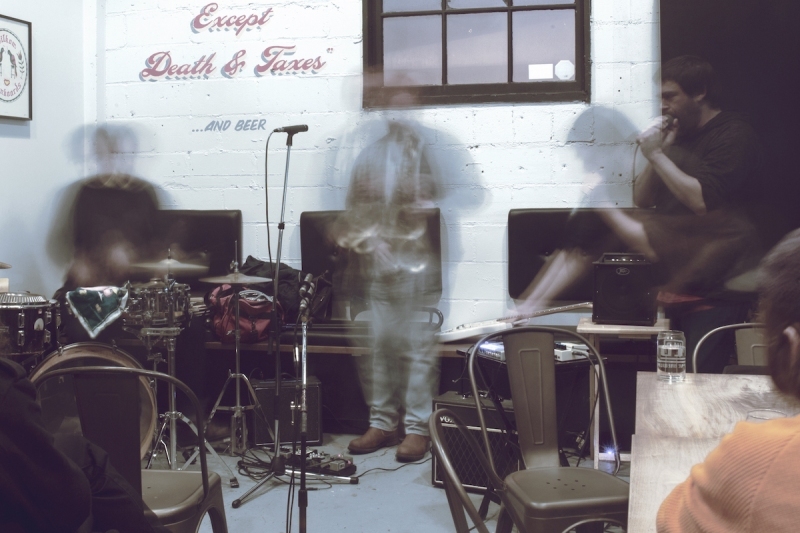 Left to right: Chad Vangaalen, Cody Oliver and Jack Sinclaire perform at the March 4, 2018 edition of Bug Incision at High Line Brewing. Photograph by Jarrett Edmund. 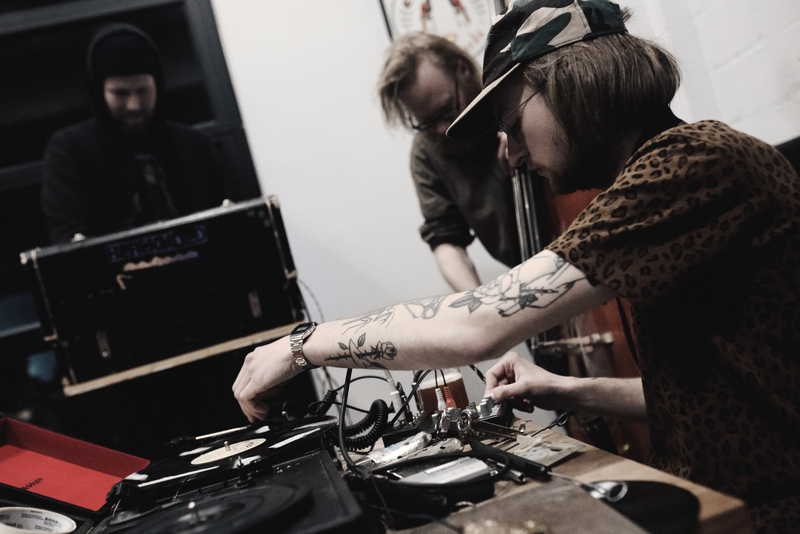 Musician Chris Dadge (Lab Coast, Alvvays, Chad Vangaalen) hasn’t had an easy time finding a home for his free improv, experimental performance series Bug Incision. The musical orphanage for bold music that doesn’t fall into any one scene bounced around from 2005 to 2018 until arriving at High Line Brewing in January 2018. It has been a success. “There has been more people than ever and I would say a more diverse and consistently new audience every time. It’s been great. It’s shocking,” he says. It was something of an easy move as far as an avant-garde night is concerned: High Line’s owners are huge music fans, and Dadge’s collaborator and partner Samantha Savage Smith is a sales representative and assistant brewer for Highline. Not every establishment would take a chance on a night that includes long-form drones and investigations of what music could be, rather than performances of what it already is. But according to head brewer JJ Mathison it has paid off. “Bug Incision has been the best recurring event at HLB by far,” he says. Beer Pairing: Smith’s suggested pairing for a Bug Incision show is the Kent Extra Special Bitter (ESB). Not only is it Dadge’s personal favourite, but much like Bug Incision it can seem intimidating at first (with its bitterness and hop intensity) but ultimately is a welcoming and palatable delight. The next Bug Incision is on November 25. How many one-man-bands does it take to change a keg? The Dandy Brewing Company is attempting to find out, apparently. After a sold-out performance from Montreal garage-rocker Mark Sultan (aka BBQ) on September 27 — the space’s first time hosting live music since opening its Ramsay taproom in April 2018 — co-founder and managing director Benjamin Leon is at it again with his booking of howling stomper Bloodshot Bill on November 28. Leon says the whole one-man-band thing is actually a bit of a coincidence: he’s a musician himself who grew up running in the same circles as Sultan and Bill in Montreal. The two routinely check in with him when planning live appearances in Alberta, and this time up he had a room of his own to host them in. Leon’s musical background has helped inform his vision for Dandy and his decisions in programming the space. His old band took on an ambitious 24-hour marathon of performances at 24 different Calgary venues back in 2013, so he knows well firsthand what it’s like to play tunes in an unconventional setting. Funny enough, perhaps fortuitous even, that one of the venues from that project was Village Brewery. In addition to Bloodshot Bill, live music plans for the Dandy space include the upcoming Dandy Fest held both in the taproom and the parking lot. The lineup of bands and DJs is still under wraps, but $5 will get you in to the party to see what’s in store for yourself. Beer Pairing: Leon has two suggestions for what to drink during the Bloodshot Bill show. The easy-drinking Dandy Lager is in keeping with indie rock’s scrappy spirit, but the bolder Dead Moon Night imperial stout (named after California punks Dead Moon) might be the best choice for a mischievous music lover. Bloodshot Bill plays on November 28 and Dandy Fest lands on December 15. 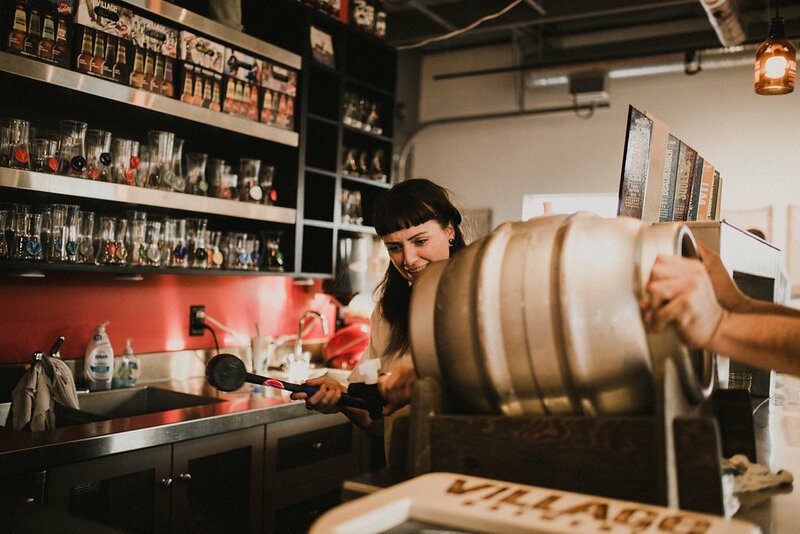 Kaely Cormack of The Shiverettes tapping a cask during a concert at Village Brewery. Photograph by Alex and Alexandra Photography. Village Brewery’s name encapsulates its mission well. Marketing and taproom coordinator Eric Daponte says whether it’s punk rock or classical music, all music programming in the company’s space has one thing in common. “I try to work with those people who are kind of familiar with the craft beer space and who are also excited to be a part of it,” he says. Village consistently holds about one to three live music events per month and each includes a collaborative cask tapping. Rather than invent an entire beer for one night, these tappings are typically collaborative modifications on existing favourites like the Blonde ale infused with lavender, for example. Village immediately sprung to mind when Kensington Sinfonia president Nathaniel Schmidt enrolled in the artsvest program, a mentorship training initiative that teaches arts organizations how to better build sponsorship relations with the private sector, and matches the support raised by each group. Not only did he once work for Village, he also respected its efforts to be supporters of the arts community. “It just seemed like the most natural choice,” he says. “The greatest part was I really had to do almost nothing to convince them to do it.” Village now sponsors the events by offering its space at no cost and waiving front-of-house fees that cover staffing for events. With a partnership established, it came time to actually figure out the music. As part of her work with outgoing Sinfonia artistic director Donovan Seidle, Laura Reid spearheaded programming for the Sessions debut 2017 to 2018 season. Her cross-pollinated musical expertise as a community radio programmer, experimental musician and classical fan made her the perfect choice to bring the Sinfonia together with indie-world artists in an unconventional space — upon the announcement of Seidle’s departure, Reid was promoted to the artistic director role. Reid says that it’s important that the “collaboration be real and meaningful for both sides” when it comes to the music for the sessions. With Village as a partner, that mandate extends from there into everything from technical arrangement and beer. The next Village Sessions with the Kensington Sinfonia aren’t until Valentine’s Day (with Astral Swans) and May 23, 2019 (with Marlaena Moore), but tickets typically sell out for these shows — you’re advised to purchase well in advance. Meanwhile, Village hosts punks Pill Crusher and Vanta on November 30, and shoegazers Heavy Dive and Paradise on December 14.